Data Subjects is a new podcast dedicated to issues surrounding privacy and freedom of information rights in Canada. The show marks FIPA’s first foray into the world of podcasts. Episodes will tackle a wide variety of topics, from the history of FOI in Canada, to the pitfalls of our modern privacy rights, and many more. Each episode will feature interviews with some of Canada’s most renowned figures from both the privacy and FOI landscapes, as well as stories from within FIPA. Data Subjects will launch this spring and will be available on your favourite podcast provider like Apple Podcasts, Stitcher, Spotify, and on our website. FIPA prepared a submission on Bill C-51 to the Standing Committee on Public Safety and National Security, asking the committee to withdraw the bill. Our submission is attached and below. FIPA is a non-partisan, non-profit society that was established in 1991 to promote and defend freedom of information and privacy rights in Canada. Our goal is to empower citizens by increasing their access to information and their control over their own personal information. We serve a wide variety of individuals and organizations through programs of public education, public assistance, research, and law reform. While our work focuses primarily on access and information rights in British Columbia, we have also played an active role in federal sphere, including in relation to the Personal Information Protection and Protection of Electronic Documents Act (PIPEDA) last month, and also on the issues related to lawful access going back to 2002. We will keep our points brief, as many of the serious concerns about this bill have already been eloquently expressed by a number of individuals and organizations. We hope you will look carefully at all the submissions, and hopefully recommend that this unjustified and unjustifiable piece of legislation be withdrawn. For unknown reasons, this Committee has declined to call any of the Privacy Commissioners as witnesses, including the Privacy Commissioner of Canada. Fortunately, every Commissioner in the country has taken the initiative to sign a public statement on the many shortcomings of C-51, including a joint letter to this Committee. Bill C-51 challenges fundamental rights and freedoms on several fronts, but the focus of our concern is on its mandate for overbroad, unregulated and intrusive sharing of the personal information of ordinary Canadians. If enacted, the portion of Bill C-51 comprising the Security of Canada Information Sharing Act (SCISA) would significantly expand the power of the state to surveil and profile ordinary, law-abiding Canadians. Some of their key points relate to the excessive breadth of concept of what “undermines the security of Canada.” They also criticize the overbreadth of the scope for information sharing under the bill, and recommend that the proposed Security of Canada Information Sharing Act be withdrawn. You have already heard from Professors Forcese and Roach about the shortcomings of C-51, and we will not repeat their remarks, but refer you to their excellent online blog for the catalog of shortcomings and overreach. Professor Michael Geist has put together a trenchant criticism of the privacy shortcomings of this bill, and you can find it set out on his blog. He refers to the proposed Security of Canada Information Sharing Act as a piece of legislation which would “eviscerate” the protections provided to personal information by the Privacy Act. We agree with his analysis and his conclusion. As the government has not seen fit to provide actual justification for the introduction of this bill beyond vague assertions of threats and platitudes about how security does not necessarily infringe on civil liberties, we thought it would be instructive to compare this Bill to current Canadians laws which provide extraordinary power to the government in emergency situations. Presumably the current situation is not an emergency, or else the government would have actually used its extraordinary powers under the Emergencies Act. The preamble is an important tool in statutory interpretation, and a guide to the intention of P:arliament in enacting the law. The preamble of the Emergencies Act is set out below. AND WHEREAS the Governor in Council, in taking such special temporary measures, would be subject to the Canadian Charter of Rights and Freedoms and the Canadian Bill of Rights and must have regard to the International Covenant on Civil and Political Rights, particularly with respect to those fundamental rights that are not to be limited or abridged even in a national emergency. This preamble sets out the need in times of emergency to take “temporary measures” to ensure safety and security AND “protection of the values of the body politic,” which may not be appropriate in normal times. 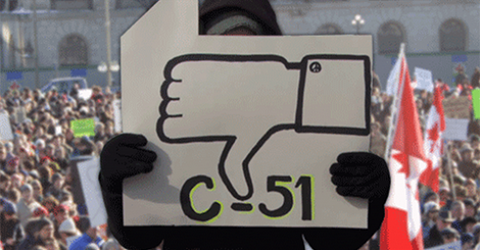 The contrast with what is contained in C-51 is startling. This section repeatedly states that the primary obligation of government is to protect itself and its people, while suggesting in its first paragraph that there is form of guarantee to be free from even threats to Canadians’ lives and security. Eventually the preamble does acknowledge, somewhat grudgingly, that its exercise of these new information sharing powers is subject to the Charter of Rights and Freedoms, and that the massively increased information sharing is to somehow be done in a way that is consistent with “the protection of privacy”. The Premiers of British Columbia and Quebec have voiced concern about Bill C-51, but have no direct mechanism to bring these concerns to the federal government other than normal intergovernmental channels. Before the Governor in Council issues or continues a declaration of a war emergency, the lieutenant governor in council of each province shall be consulted with respect to the proposed action to the extent that, in the opinion of the Governor in Council, it is appropriate and practicable to do so in the circumstances. Note the use of the word ‘shall’, making this consultation mandatory. The method and timing are left to the discretion of Cabinet, but this does not remove the obligation to consult. There is no equivalent to this in C-51. The government also has to seek Parliamentary confirmation of a declaration of emergency under the Emergencies Act. It must put a motion before each House, “together with an explanation of the reasons for issuing the declaration and a report on any consultation with the lieutenant governors in council of the provinces” seven sitting days after the declaration is issued. These declarations only last 120 days, but can be renewed. In contrast, C-51’s provisions do not have any kind of time limit or even a sunset clause. Bill C-51 provides no element of parliamentary oversight, despite a massive increase in surveillance and other powers to be exercised in vaguely defined circumstances. This compares unfavourably with what Parliament saw fit to provide in an actual emergency in time of war, which is presumably a more serious threat to this country and its people than whatever threats we are currently facing. This Committee would have members from all parties in both Commons and Senate. Those members would be sworn to secrecy and its meeting would be private, but the Review Committee would report to Parliament on how the government is exercising its powers and functions every 60 days for as long as the declaration of war is in effect. The Review Committee also has the power to revoke or amend government regulations referred to it. Nothing like this exists in C-51, nor has the government provided any rational explanation of why not. The B.C. Freedom of Information and Privacy Association asks this Committee to recommend the government withdraw this bill.